ENGRAVE YOUR FAVORITE DESIGNS WHENEVER AND WHEREVER YOU WANT! Ever wanted to engrave your own ideas and designs onto your personal belongings? Do you wish that you could personalize everything you own whenever and wherever? Our Mini Laser Engraver is the first of its kind in affordable laser printing technology. No longer do your ideas have to stay uncreated and imaginary. The Mini Laser Engraver allows you to bring your designs to life and engrave your wildest ideas onto your favorite objects! From phone cases, and business cards, to wallets and keys, the possibilites are endless, Engrave it all with our Mini Laser Engraver! Simply connect the engraver to your computer using the included cables and download the necessary software. To begin using, simply select any photo from your computer and position it in the area that you want to engrave it on. With the click of a button, the engraver will instantly begin engraving your design! Precise, portable, and very powerful, this Mini Laser Engraver is the perfect gift for anyone! Our Intelligent Laser Engraving Machine features the latest print carving technology and is more practical than a traditional engraving machine while still remaining at only a fraction of the price. Made out of brushed gunmetal and weighing in at under 4 pounds, this mini laser engraver is the ultimate portable high precision, high stability DIY engraver. It supports both offline & online operation. 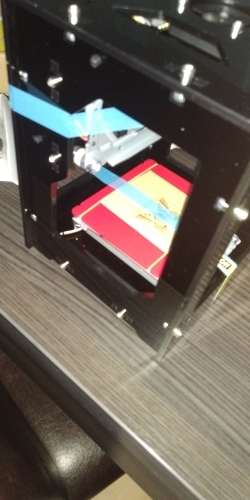 Stable and strong structure - with 108 screws and light-weight alloy structure, you can be sure that this printing device will stay intact and strong! Can be used offline - just connect the two USB ports to charger or power bank (5V 1A) and you are set to continue engraving and printing! Stable laser and fast carving - the real 1000mW blue and purple laser head allows up to 10x faster carving time than our competitors! Carve and Engrave All of This! Win 7, XP, Win 8, Win 10. Unique frame & auto low light positioning frame positioning makes image positioning easier than ever. Professional power IC and radiator means carving time will last much longer and carving performance will be much more stable than other lasers. True 1000mW blue laser head allows for precise engraving and supports many types of materials. Items that can be carved include: mahogany, bamboo, paper cards, ivory, leather, flammable plastic, PCBA, and more!